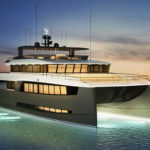 Philippe Briand has unveiled the latest sailing yacht concept to come from his London- based design studio: the 90-metre (300-foot) SY300. With a traditional sailing rig, the 1,550-tonne ketch has been created to outperform other sailing megayachts on the water today, as well as to provide a head-turning aesthetic and ultimate comfort on board. The SY300 would be the ultimate prize possession for a passionate sailor who demands speed on the water as well as exceptional design and style. 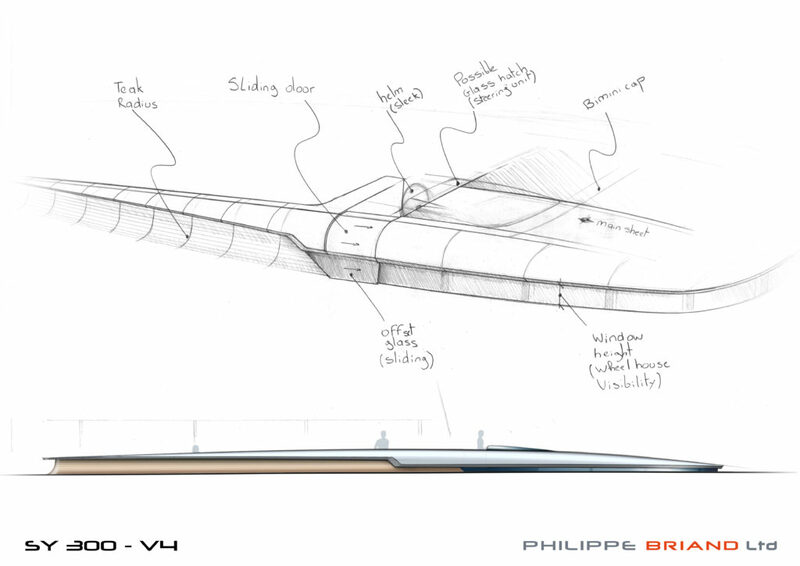 Driven by the pursuit of efficiency rather than opting for a faddish design, Philippe Briand chose a conventional two-masted sailing rig to complement the contemporary hull with its inverted bow, as this proves to be the most effective. 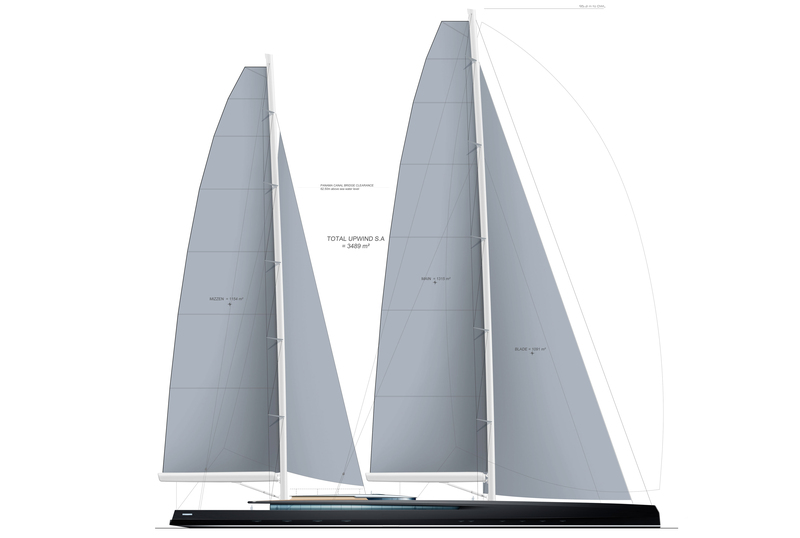 With its foremast towering 95.3 metres above the waterline, the SY300’s upwind sail area is 3,560m2, while its downwind sail area is 6,600m2, including a 3,500m2spinnaker. 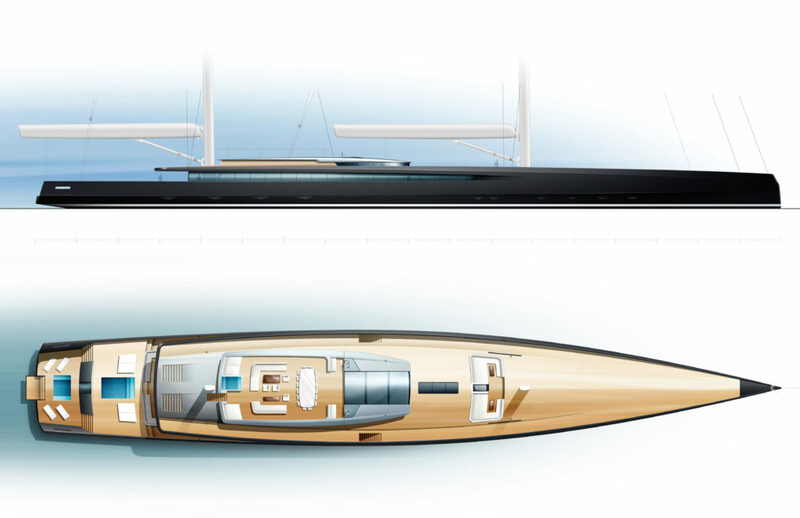 The yacht’s length at the waterline is 78 metres, with a maximum beam of 14 metres. Although the sailing yacht design includes three capacious decks for ample guest space, Philippe Briand has been careful to ensure well-balanced proportions deliver a sleek overall aesthetic. This includes a spectacular fly bridge in the flush sun deck, which covers an area of 112m2 and 14.8 meters in length. The star attraction of the exterior, the fly bridge will be a magnet for friends and family to come together, where up to 14 guests can experience the uniquely thrilling sensation of movement created by harnessing the natural power of the wind. Of course, full enjoyment of the SY300’s exterior can come at anchor or in port as well as while cruising or racing. The uncluttered decks are contemporary and allow stunning views of the surroundings. Each of the three decks offers guests a choice of swimming pool, paired with oversized sun pads or sun loungers.An enormous dining table in the heart of the fly bridge seats up to 16 guests, with superb panoramic views and a removable bimini offering protection from the sun. The adjacent convivial seating area features two L-shaped sofas with low tables, while a more secluded seating area on the foredeck is perfect for a romantic sundowner or some private reflection time.